There were no bones, but the kids in the audience didn’t care. “That dinosaur is pretty big,” observed the young man next to me. “Are they gonna fight?” he asked his dad. They did. The animatronics shuffled forwards and backwards, towards each other and away again, loud roars playing over the speaker system. The dinosaurs looked very obviously fake, but also very obviously expensive; the risk of damaging them far outweighed the desire to pretend to spill blood to sate the cries of bloodthirsty five-year-olds — a reluctance which, in its way, reflects what anyone who’s watched a nature documentary knows: that predators in the wild will rarely risk injuring themselves. That’s why they prey upon the weak and the old, though whether this nuance was apparent to the rest of the audience was not clear. The show started with eggs hatching somewhere on the megacontinent known as Pangea. (There was sort of a funny use of the past tense to describe Pangea: “This continent was known as Pangea,” as if there was anyone around at the time to call it that.) That was the only place to start, of course, because it was the beginning of the story, and in the beginning, and there is nothing, and indeed there was nothing in this particular corner of Pangea, no plants, no dinosaurs, no other animals, just the eggs, until one of them, shortly after it hatched, was stolen and eaten by a scavenger. 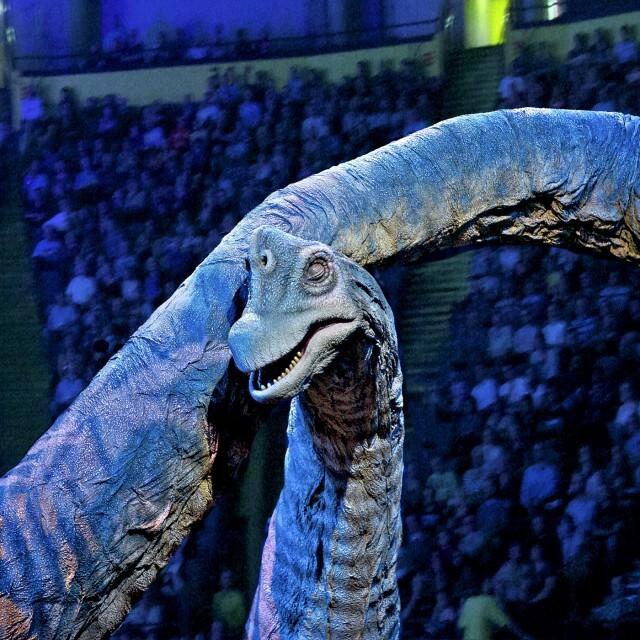 It is a harsh world, “Walking With Dinosaurs” tells its audience. The first to hatch is only the first in line to be eaten. The mother dinosaur arrived, eventually, to fend off another marauder. Her eggs hatched, and the audience ooh’d and aah’d as baby remote-controlled dinosaurs squirmed around the stage, squeaking. This went on for a little bit longer than it needed to — like every segment — before we transitioned to the Jurassic period, which Huxley describes to us as “a wonderful time for dinosaurs.” In the Jurassic period, we met the brontosaurus and allosaurus, who also fought (“fought”) and whose fight (“fight”) took the form of a mother dinosaur successfully defending her child from a predator. It would be too gruesome, maybe, to expect children to applaud while watching predators feast on the flesh of a mother and child, still living; the velociraptors — a pack of two males led by a dominant female — were the only carnivores who got to eat anything during the show, tearing imaginary pieces out of the corpse of an indeterminate dinosaur we didn’t get to see them kill. In the Cretaceous period, we met the Tyrannosaurus rex. It was big, and loud, and the maternal dynamic was flipped: Her offspring, investigating two large, armored herbivores, found itself trapped in a corner, facing down horns on one side and a clubbed tail on the other. Not a moment too soon, the curtains pull back and the big rex emerged with a roar to chase off the lumbering, leaf-eating bullies. It then cantered around the arena, eyeballing the children in the audience and roaring about its dominance. Like any reasonable five year old, I wanted to be a paleontologist when I grew up, and my favorite dinosaur was Tyrannosaurus rex. There were periods of time, certainly, when I might have pretended to favor other dinosaurs, especially around the time of the discovery of the big, clever Utahraptor. Those were lies, mostly: my first and truest love was always Tyrannosaurus rex. By the time I was confirmed, I’d discovered that not only that were there other religions, but that there were people who thought that institutional religion wasn’t even really worth one’s time at all. I read the Transcendentalists and argued with my father; I told him I believed in God, maybe, but that I was anti-ecclesiastical, and moreover, that I couldn’t square with the Catholic belief in transubstantiation. They were big words and I took smug pleasure from the thought that maybe he didn’t even know what they meant, because I was in seventh grade and was therefore insufferable. Ironically enough, it was in college that I re-discovered Christian literature, full of miracles and meaning, if not Christianity. Poets like Milton and the (maybe, secretly, Catholic?) Donne and Herbert brought me into contact with questions of God, and faith, and solipsism, and the necessity of recognizing and remembering that there are people in the world besides myself more readily than any mass, or any catechism class, I’d ever been to. So when a priest refused to let me participate in the baptism of my cousin Emma this weekend because I’m not a practicing Catholic, I was knocked back in time to seventh grade, grinding my teeth and yammering away wordlessly, soundlessly in my mind about the Church’s bureaucracy and hypocrisy — that didn’t they see that this is what necessitated the transition from the Old Testament to the New Testament in the first place, the overemphasis on empty rites and rituals, the hollowing out of meaning and on and on in a simultaneously self-pitying and self-aggrandizing spiral that spit me out into the parking lot outside the church, cursing. “Your parents raised you Catholic,” the priest said. “They want you to be Catholic.” (My mother rarely went to church, and doesn’t take Communion when she does, for weddings and things, and my dad converted to Episcopalianism a little over a year ago.) “Let me know if you start doing what you ought to be doing, and I will consider naming you Emma’s godfather,” the priest concluded. What I ought to be doing, of course, is going to mass — and probably also giving money to the church. And yet, surely there is a way to put things in their place without being a total fascist about it. I moved into a new apartment a couple months ago, and for the first time I have a desk. I’m trying to keep it clean, or at least neat, and not just on top of the desk but in the drawer as well. My desk faces a window and hanging on the wall to my left is a corkboard, covered in notecards organized into columns: Ideas; Pitched; Assigned; Reporting; Writing; Filed; Revision. Notecards move through these columns at various speeds. Some get stuck. Others spend hardly any time up there at all. When I’m feeling panicky — about work or life or dating or anything at all, which can so easily become everything at once — I lean back in my chair and just look at the corkboard.